black sheep New Music: Black Sheep "Ho's Short For Honest"
New Music: Black Sheep "Ho's Short For Honest"
Though there certified gold debut album, A Wolf In Sheep’s Clothing, was released over twenty-years ago; Black Sheep has undeniably etched out its on space in hip-hop’s consciousness. Dres & Mista Lawnge exploded onto the scene with “Flavor Of The Month,” “Strobelite Honey” and the chart topping single “The Choice Is Yours” (Revisited) which you still hear regularly thanks to its inclusion in a handful of TV commercials over the years. Members of the legendary and influential Native Tongues Click (A Tribe Called, Quest, De La Soul, Queen Latifah, Jungle Brothers, Monie Love), Dres & Mista Lawnge disbanded the group due to creative differences after they released their sophomore album Non-Fiction; disappearing almost as quickly as they rose to prominence. On the heels of Black Sheep’s breakup, Dres has appeared on a few choice De La Soul tracks (“Fanatic Of The B Word” & “En Focus”), a collaboration, “Back On The Scene” with Slaughterhouse where they interpolated “The Choice Is Yours” for their Slaughterhouse EP and guest appearances with Twista and Rhymefest; and outside of a few sporadic solo projects, Dres has been largely working behind the scenes in both music, television and film. 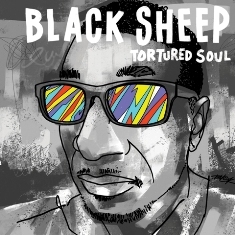 That all changes on 8-10-18, as Dres (now working solo) picks up the baton by releasing a new Black Sheep project entitled Tortured Soul. The jazzy aesthetic the group displayed in its heyday is once again at the forefront on “Soul,” “Higher” featuring Jarobi of A Tribe Called Quest and the heartfelt dedication “Peace Phife” where DJ Red Alert, Chi Ali and Sadat X join Dres to reminisce and spin yarns celebrating Phife’s life and legacy. Black Sheep’s Tortured Soul will be released on 8-10-18 and is now available for pre-orders and favoriting.